Simple utilitarian vessels of backed clay have been made in all societies since the dawn of civilization. The Europeans first saw oriental porcelain when Marco Polo returned from China. Its delicacy, beauty, and strengh created a sensation, and the Europeans started searching for the raw materials as well as the formula and methods that would enable them to produce it. 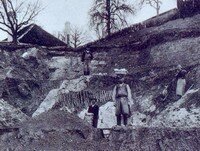 In 1709, Kaolin (decomposed granite or china clay), was discovered in Meissen near Dresden. The French dicovered deposits near Limoges in 1769 and by 1800 an industry had developed in France. Limoges has reflected the art movements and life style changes of each stylistic period since then.